Derma Divine Collagen Lotion® is a unique blend of ingredients formulated to help moisturize the skin as well as penetrate the skin. * The collagen used has a small molecular weight, which along with other excipients, penetrate the layers of the skin. 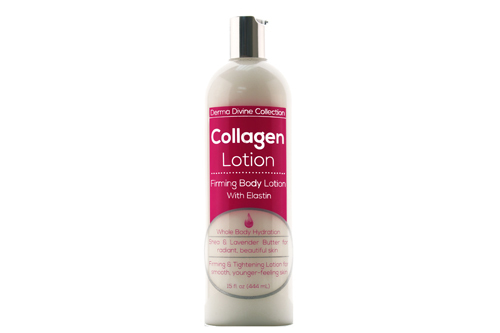 Along with Elastin, Derma Divine Collagen Lotion is best used as a moisturizer for the the whole body! If Collagen is a thread, Elastin is the elastic band that keeps the fabric together. As you can imagine when your elastin levels decrease with age, your skin sags. Just like Collagen, the older you get, the less of this important protein your body produces. That’s why we have formulated the special lotion that will work to keep your skin’s structure, tone and elasticity. Leaving your skin soft and radiant!